A Federal High Court, Abuja, on Monday, granted an interim forfeiture order of a property belonging to former first lady, Mrs Patience Jonathan. 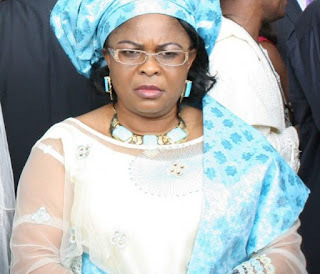 Justice Nnamdi Dimgba, who granted the order, held that it was to enable the Economic and Financial Crimes Commission, (EFCC) investigate the acquisition of Ariwabai Aruera Reachout Foundation, a property liked to Mrs Jonathan. Dimba however held that the order would elapse after 45 days. The EFCC had filed an exparte motion seeking temporary forfeiture of some properties allegedly belonging to Ariwabai Aruera Reachout Foundation. The properties are said to be located at plot 1758, Cadastral Zone, B06 Mabushi and Plot No.1350, Cadastral Zone, Central Business District, Abuja. The anti-graft agency also asked the court for an order stopping any disposal, conveyance, mortgage, lease, sale or alienation or otherwise of the properties. The agency said application was predicated on the fact that the property was a subject matter of investigation, inquiry and examination. The judge in his ruling on the exparte motion, granted the EFCC a 45-day of grace period within which to investigate whether the property was acquired by Jonathan with proceeds of crime. “I have carefully considered the processes filed. I have also carefully considered the arguments. The judge also dismissed the motion challenging the originating summons. Mrs Jonathan’s counsel, Mr Mike Ozekhome (SAN), in his reaction to the court’s ruling, said it was a well considered judgment. “We did not lose; we won,’’ he said.